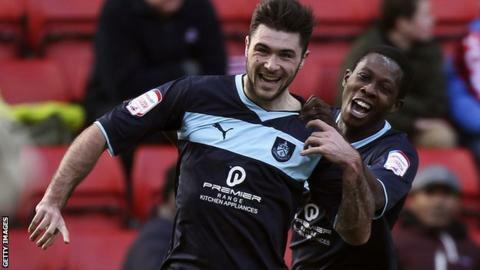 A stunning Charlie Austin goal gave Burnley a first win in seven games as they beat Charlton. The home side had gone close when Danny Haynes's header was tipped over by keeper Lee Grant before Austin scored with a 25-yard effort. The former Swindon man's strike ended Burnley's 348-minute goalless run. Grant kept out another Haynes header, while Michael Morrison nodded wide as Charlton had plenty of late pressure but failed to find an equaliser. The Addicks' defeat was their eighth home loss of the current Championship campaign. The visitors thought they had taken the lead early on when Junior Stanislas found Martin Paterson, whose finish was ruled out for offside. Austin confirmed Burnley's grip on the game with an eye-catching goal just before half-time, although Charlton almost equalised when Bradley Pritchard's effort was deflected narrowly wide. Addicks keeper David Button then fumbled a Kieran Trippier cross and had to react quickly to deny Austin the chance of a second. Burnley keeper Grant was in more assured form at the other end, his save from Haynes's header helping secure his side's victory. "We should have got something from the game. "We asked questions of them but they answered them. Our supporters have been terrific and in some ways we don't deserve it because of how bad we have been. "This is a crucial week coming up for us with trips to Peterborough and Huddersfield and we need to pick up something from those games." "I think that's the best result I've had as a young manager learning my trade. "We had five senior players missing so to deliver that performance was terrific. I don't get too high with the highs or too low with the lows but we're a team that is improving in several ways. "Like all of us on this difficult run, Charlie's been questioned a little but he's answered all of his critics today. It was some goal."